Raptor | 13 The Creative Constructions of Richard Powell » Blog Archive » And So It Shall Be Named! And So It Shall Be Named! So the “super secret project” now has a name: Rusted. At least, that’s the current working title. Many things can change between now and then. When? Whenever I can get this all off the ground, of course. Below is a piece of concept artwork from Rusted. This is me experimenting with a monochrome style to see how well it fits. Let me know what you think! Constructive comments are appreciated! This entry was posted on Thursday, June 25th, 2009 at 6:00 am	and is filed under Artwork and Design. You can follow any responses to this entry through the RSS 2.0 feed. You can leave a response, or trackback from your own site. I really like the piece, but I know I’ve told you that before. *smile* However, I have a question. With the monochrome technique will it be more difficult to make details stand out? I would hate for you to put so much work into the details and for them to get lost due to lack of enhancement. Also, will it be more difficult to creat the element of depth? Just curious what you think. 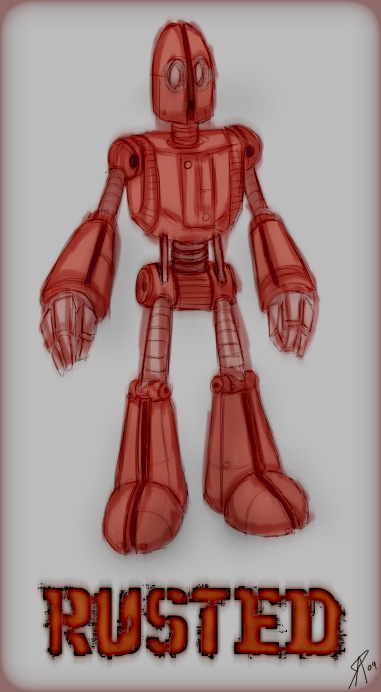 I like the overall shape of it, especially the Abdomen and the hands, I think the elbows need a bit more definition though, it sort of looks like theres no way the robot is able to bend it’s arms. The linework and details are pretty spot on and give it a nice touch, I think what would give this picture more Oomph is a stronger light source, on either side and maybe a secondary dimmer light source to give it a more metallic feel. @Nothus, thanks! I’ll keep that in mind for future concepts for this project. This was largely purely a character design concept, so I didn’t pay a lot of attention to lighting and whatnot. I’ll rectify that as I do more. First of all, you have won me over with the whole Steam-Punkess look at feel of your work. I think we are in a revival of Steam Punk, so your work is timely and fresh.